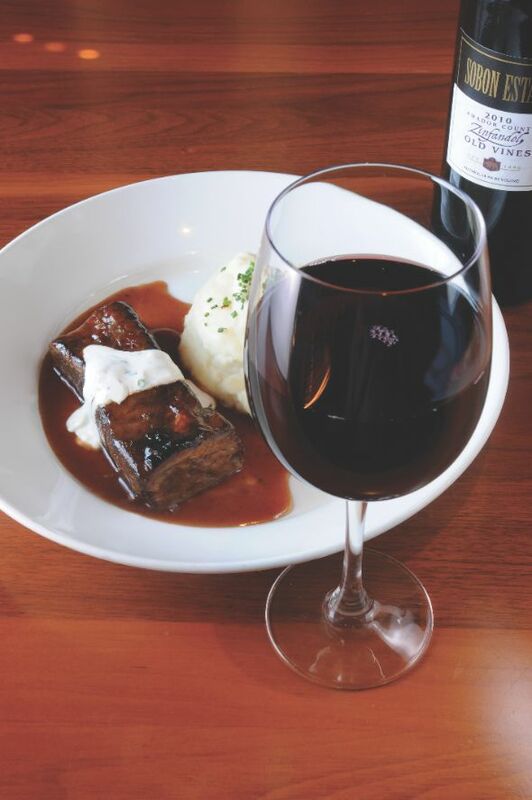 When you hear the phrase “wining and dining,” what comes to mind? Do you picture fancy French vinos in a five star, white tablecloth atmosphere, or a night in with friends and loved ones where homemade delicacies and locally produced pours top the menu? 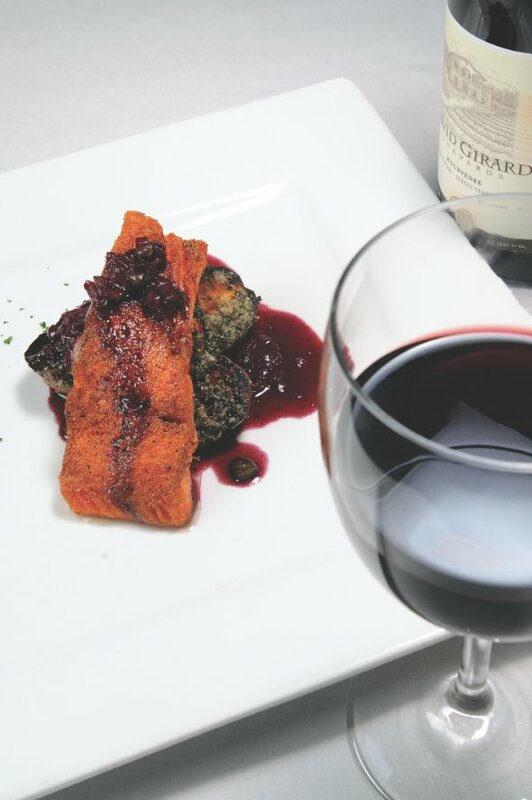 Take it from Style’s favorite local chefs – the art of cooking with wine is well within reach. 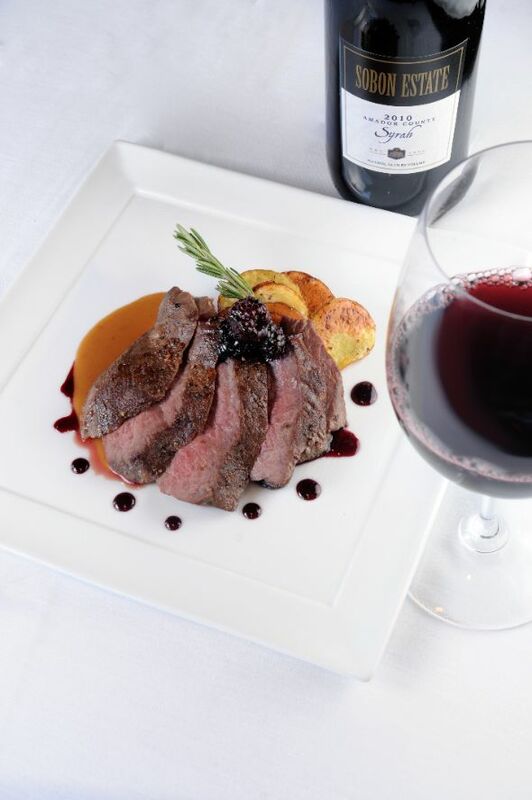 Whether you prefer red or white, bold or subtle, you’ll want to uncork our culinary experts’ collection of dishes featuring the best local libations. Cheers (and bon appétit)! “Mariniere” refers to the way in which the fisherman would prepare the mussels – right on the boat! We prefer the Mediterranean mussels when available because of their size and plumpness. When these are not available we use PEI (Prince Edward Island) mussels. Clean the mussels. Before cooking mussels, a clump of dark threads called “the beard” must be removed. Because this can kill the mussel, we recommend cleaning and de-bearding the mussels as close to cooking time as possible. First, clean the mussels with a brush under cold, running water to remove sand and grit. Then pull the beard away from the mussel with your fingers or a small pair of pliers. Place a large sauté pan over medium heat. Add the olive oil. Once the oil is hot, add the minced garlic and shallot. Season with salt and pepper, and cook until the shallots begin to sweat, stirring often. Add the tomatoes and then the mussels. Toss the mussels to coat with the shallots, garlic and tomatoes. Add the Moniz Family Chardonnay and cover the pan with an inverted sauté pan or lid. Allow the mussels to cook over medium heat, checking after 4-5 minutes to see if the shells have opened. Once all of the shells have opened, place a new sauté pan over medium-high heat. Carefully strain off the broth from the mussels into this new pan. As the broth heats, it will reduce slightly and concentrate in flavor. After the broth has reduced to approximately 75 percent of its original volume, add the chilled butter to the pan, swirling to incorporate. Once the butter has been incorporated, add the parsley, a squeeze of lemon juice, and season to taste with salt and pepper. Arrange the mussels in one large bowl or several smaller bowls. Pour the broth over the mussels. Hawks serves this dish with either grilled country toast rubbed with garlic, or French fries…so long as there’s something to soak up the broth! To make the salt-blanched diced and shaved summer squash: First, shave 10-12 thin slices of squash on the mandolin. Then use the remaining squash to dice in small cubes. Place both items in a colander and sprinkle with about 1 tablespoon of salt. Allow squash to leach liquid while rice is cooking. Before plating, blot squash on a paper towel to dry. To make the Parmesan crisp: Place a Silpat or piece of parchment paper on a sheet pan and sprinkle 1 cup of Parmesan in an even layer, making a 2” x 4” rectangle in the middle of the tray. Place cookie sheet in 350-degree oven and bake until golden brown. Remove from oven and cool before use. To make the risotto: Melt 2 tablespoons of butter in a 4-quart saucepan. Add diced onions and sweat on low heat until onions are translucent (approximately 10 minutes). Add rice and toast in butter for about 3 minutes. Add David Girard wine and continually stir rice until wine has evaporated. Begin to add your vegetable stock, one-half cup at a time, stirring constantly and adding stock as it incorporates. It should take approximately 20 minutes for all the liquid to absorb and the rice to be cooked. Once done, stir in 3 tablespoons of Parmesan cheese and 1 tablespoon of butter, off the heat. Add the diced squash, lemon juice and season with salt. Before plating, lightly dress the herb salad and shaved squash with olive oil, lemon juice and salt. Place risotto on plate in a flat circle; lightly scatter the shaved squash and herbs. Break Parmesan crisp in bite-size pieces and sprinkle across the top. Crack black pepper over enitre dish to finish. Trim any excess fat from the short ribs, salt all sides and refrigerate for 24 hours. Preheat to 450 degrees (if you have a fan turn it on). In a roasting pan, spread the ribs evenly but do not overcrowd them; place in the center of the oven for 50-60 minutes or until dark brown (turn them once, halfway through the roasting process). Rough chop all the vegetables and place them in a pre-warmed Dutch oven on the stovetop. You want the vegetables to be nicely caramelized; once they get to that point, deglaze with the wine and reduce by half. Add the beef stock and herbs and bring to a boil. Pour over the browned rib meat. Return to the oven (set to 275 degrees) for 3.5 to 4 hours, turning the meat every 30 minutes. The ribs are done when they are soft (you want them fork tender). Let the ribs cool at room temperature in the jus for 3 hours. Once cool, remove them and place in the refrigerator. Strain the cooking liquid and discard the vegetables. Place 4 cups of the cooking liquid into a saucepan. Add beef stock if more liquid is needed. Bring to a slow boil. Combine 1/3 cup Sobon Zinfandel with 1/4 cup cornstarch; whisk together and add to the hot liquid. Add 1/4 cup of gluten-free tamari to the mixture. Bring everything to a boil and reduce by half or until the mixture coats the back of a spoon. Skim and strain the liquid and cool; the sauce will continue to thicken as it cools. Once it is the correct consistency, adjust seasoning (salt and pepper). In a large sauté pan, melt 2 ounces of unsalted butter and add 3 tablespoons of chopped Italian parsley. Place the ribs in the pan; gently pull the meat open to help heat (do not tear apart). Add 20 ounces of the braising liquid and bring the pan to a quick boil. Place the pan in an oven preheated to 475 degrees – turn meat once after 10 minutes. When heated through, place a portion of mashed potatoes on a plate, then add a rib portion alongside. Spoon the sauce over the ribs and around the plate. Place a pat of butter on the potatoes and garnish with fresh chives. Garnish the meat with horseradish cream sauce (equal parts horseradish and sour cream) and enjoy with a glass of Sobon Estates “Old Vines” Zinfandel. Combine figs, Port, oil, vinegar, herbs, pepper, olives and garlic in a saucepan and bring to a boil over medium heat. Cook until tender and liquid has been reduced by three quarters. Season with salt and pepper to taste. Refrigerate for at least two hours, but preferably overnight, to allow the flavors to blend. Place cream cheese and bleu cheese in a microwave bowl and heat for about 15 seconds just to soften. Mix together thoroughly. Slice baguette. Brush with olive oil and place under the broiler, just long enough to toast. 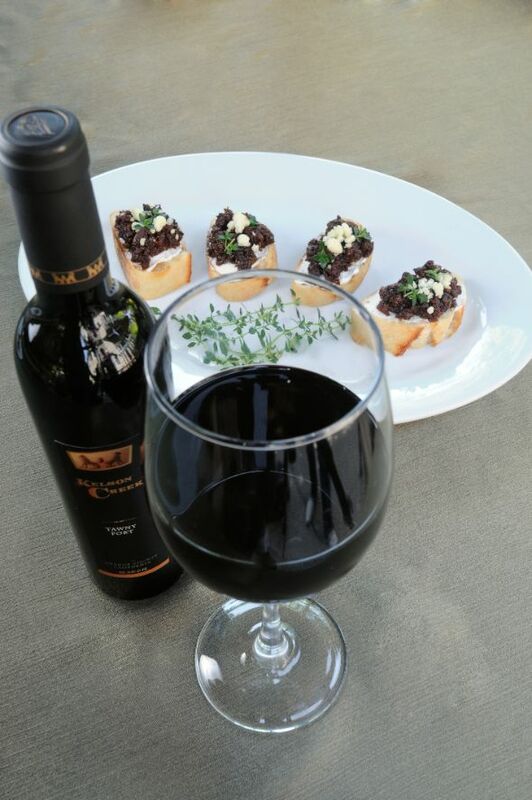 Spread cheese mixture on toast; top with tapenade and garnish with a few crumbles of bleu cheese and a small sprig of fresh thyme. Preheat oven to 425 degrees. Wash new potatoes and cut in half. Heat skillet on stove and add 1 Tbsp. olive oil and new potatoes in pan, cut side down. Bake for 20-25 minutes, depending on size. Turn another skillet on medium heat and add 1 tablespoon of olive oil; add salmon and sauté for 4 to 6 minutes. Turn salmon over and sauté for another 4 to 6 minutes. Remove salmon from pan. Add capers, red onion, garlic and sauté for 3 minutes. Add Mourvedre, mustard and balsamic vinegar. Reduce by half. Turn off heat. Stir in butter until melted and season with salt and pepper. Put potatoes and salmon onto plates. Pour sauce on top and garnish with herbs. Clean lamb sirloins of any extra silver skin. Place in a non-reactive pan. In a small bowl, combine sliced garlic, shallots, rosemary and thyme sprigs, and 1/4 cup canola oil. Pour over the lamb. Wrap tightly with plastic and refrigerate overnight. For the lamb: Preheat oven to 400 degrees. Wipe the garlic, shallots, herbs and extra oil from the lamb; let sit at room temperature for about 10 minutes before cooking. Season liberally with kosher salt and ground black pepper. Heat a medium sauté pan over high heat. Add in 1 tablespoon of oil and gently place 2 lamb sirloins in the pan. (It’s best to use two pans or sear the lamb in the same pan, two at a time to prevent overcrowding; this will ensure the proper sear on the lamb.) Allow lamb to brown nicely on one side, then turn over and continue to sear for another minute. When all four lamb sirloins are seared, place in the oven and roast for 7-8 minutes (for medium rare). Remove from oven and let rest at least 5 minutes before serving. For the potatoes: Slice potatoes into 1/4” slices. Place in a bowl and toss with olive oil, salt and pepper. Spread potatoes onto a baking sheet lined with parchment. Place in oven and roast for 10 minutes. Return potatoes to mixing bowl, add the minced rosemary and garlic and toss again to evenly coat. Return potatoes to baking sheet and roast another 10-15 minutes until golden brown and tender. Combine all ingredients in an All-Clad pot. Bring to a boil, reduce to a simmer and cook until thickened. Cool to room temperature.